Today’s economic data releases from the Office for National Statistics – on trade and production – show that rebalancing of the UK economy has gone into reverse. The coalition government wants to see growth in the UK led by exports and manufacturing and a narrowing of the persistent trade deficit. These figures show the trade deficit is widening, export volumes are falling and manufacturing output has been flat this year. 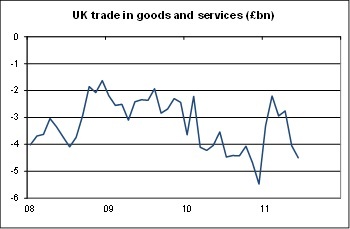 The UK’s trade deficit, in goods and services, was £4.5 billion in June: the largest since December 2010. Having narrowed substantially in January and February, it has widened steadily over the last four months and is now back to the levels seen through most of 2010. Import volumes (excluding oil and erratic items) have fallen, reflecting the weakness of demand in the UK over the last nine months. But export volumes have fallen too because there has been a significant loss of momentum in the global economy – the result of higher oil prices and the withdrawal of fiscal and, in some countries, monetary policy support. Export volumes in the second quarter were 4.6 per cent lower than in the first quarter. Special factors – the royal wedding and the Japanese tsunami – explain some of this decline but their effect was in April. 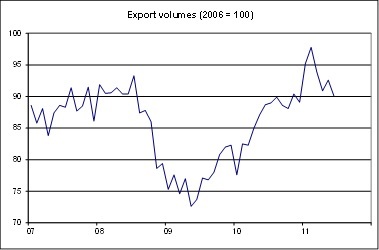 They cannot explain why export volumes in June were lower than in any month since December 2010. This weakness in exports, together with slackening domestic demand, has brought output growth in manufacturing to a halt over the last five months. And surveys of business confidence suggest the short-term outlook remains gloomy. The UK has relied on the service sector for the modest overall growth in the economy recorded in recent months, and it is likely to be relying on the service sector in coming months too. So it appears that little has changed in the UK economy. When the global conditions are extremely favourable – booming world trade and a very competitive sterling exchange rate – exports and manufacturing can grow strongly and the trade balance can be narrowed – temporarily. But a sustained rebalancing of the economy remains elusive. It is likely to remain so unless the government is prepared to develop an active industrial policy designed to promote sustainable and better balanced growth. 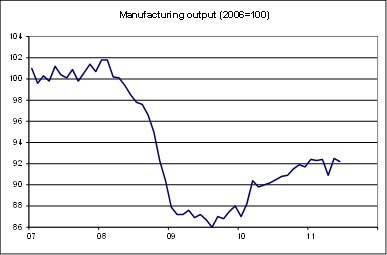 UK government needs to stop paying lip service to assisting manufacturing and offer some real assistance. This should be in the form of subsidies or removing the onerous red tape faced especsially by the SME’s.